There are many opinions as to how valentines came to originate. The most popular theory that a priest named Valentine was executed on the order of Emperor Claudius II for secretly marrying couples in ancient Rome. With it comes a lengthy and oft repeated story of his jailor’s blind daughter, a miracle of restored sight, a love note sent while awaiting execution, and so forth. Whichever of the stories you embrace, the date of February 14 is set aside to honor St. Valentine and is a time to exchange love messages now known as valentines. During the Civil War, most Confederate valentines were hand-made due to the scarcity of paper caused by the blockade cutting off importation of paper sources from the North and Europe. 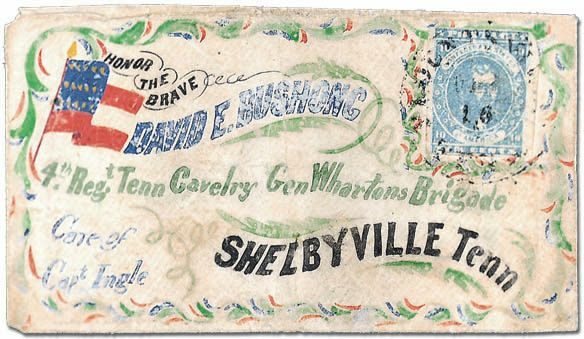 As there were only fi ve such days during the War, Confederate valentines are obviously rare and especially sought after. 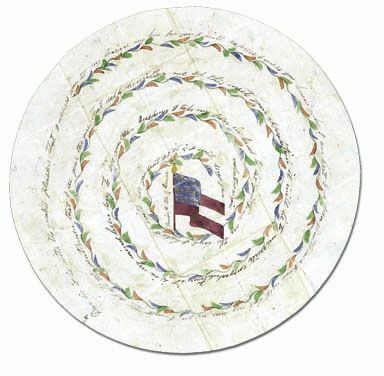 Arguably, the most well-known of these Confederate valentines is a large circular valentine, an amazing example of colorful folkart on both the cover and the valentine. The circular verse culminates with a Confederate fl ag in the center, a spectacular design. I am grateful to Scott Trepel of Robert A. Siegel Auction Galleries, Inc. for providing it for illustration with this article. It has been sold more than once through the Siegel fi rm and understandably generated much enthusiastic bidding and escalating high prices over the years. Another Confederate valentine that has remained in my memory for decades was one from the late David Kohn, a mentor of mine in the early 1970’s when he was then in his nineties. His valentine was a treasured family heirloom from his father, Theodore Kohn, who had enlisted in the Edisto Rifl es from Orangeburg and was in Charleston when the fi rst shots were fi red at Ft. Sumter. While I don’t know whether the valentine remained in the family or moved on to a lucky collector, the verse and story always stuck with me, partly because Dave was the closest direct link to the Civil War that I ever met. Dave’s father was the oldest of ten children who settled in South Carolina from Germany in 1850. When Theodore was ten years old, he was taken into the family of his uncle and grew up in the company of his young cousin, Mary Louis. For Valentine’s Day 1863, his cousin Mary made him a valentine in which she teased him about his curly hair and his unusual eyes, one brown and one blue! It was posted in an embossed envelope with a pair of Confederate 5¢ local prints, Scott #7, to James Island via Charleston. For those I’ll love thee ever. David Kohn wrote of this cherished family treasure in the first all-Confederate issue of the old Weekly Philatelic Gossip in February 1951, a magazine that I still enjoy poring through over fifty years later. I think of The American Stamp Dealer and Collector as a modern version of that outstanding publication to which philatelic luminaries of old contributed.